← Super Special Video Bonus! It started on Thursday. Girls started appearing in the Teachers’ room with enormous shopping bags filled with smaller cellophane bags of homemade sweets. At first I thought they were trying to get a jump on the situation— perhaps bringing their treats a few days early would make them stand out? Then I realized that the 3rd Years had Monday off, so they weren’t going to be here for Valentine’s Day proper. In fact, the biggest piles of treats seemed to be collecting on 3 Year Teachers’ desks like sweet, chocolatey snow drifts. The Japanese celebrate Valentine’s Day a bit differently from how we do in the West. It was first introduced here by the chocolate company Morozoff in 1936, and didn’t really take off until the 70’s. Since then Japan has developed it’s own traditions and practices a bit different from ours. First off, it’s not a particularly big date night—that’s Christmas Eve in Japan. Instead, it’s more of a day for declaration of feelings, be they romantic or affectionate or appreciative. The declarer of the feelings is exclusively female, in a practice reminicisent of a giant cultural Sadie Hawkins Day Dance. According to Wikipedia, this stems from a typo in the original marketing campaigns, which really cracks me up. A culturally unique and pervasive tradition, resting solely on the fault of a typo! There has also been a trend recently towards tomo-choco, or “Friend Chocolate”. 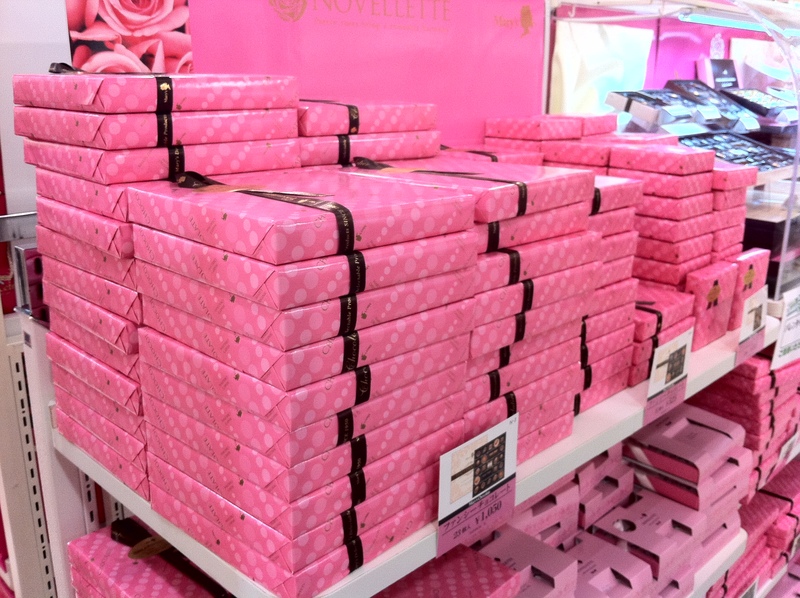 This is chocolate given from female to female, and it seems quite smart to me—this way girls aren’t left out of the fun of receiving chocolate, and it opens the market up a bit more. Many of the chocolates on the shelves were obviously packaged to appeal to women, both for purchasing and receiving, and I think it’s a great idea. I’ve even heard some people suggest that it may replace giri-choco, which may be fading a bit. At my school, the female teachers split up by grade and together purchased chocolates for the male teachers of their grades. They weren’t much more than 5 or 600 yen, so less than 10 dollars each, and most had a little note saying who they were from, and thanking them for their help throughout the year. One of my coworkers explained that in this sense, Valentine’s Day is a holiday for saying Thank You, and even likened it to Thanksgiving. 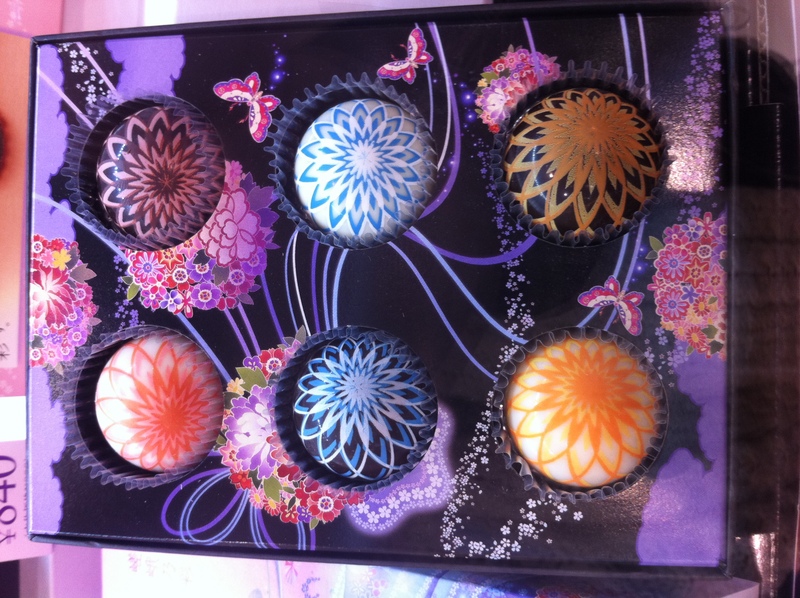 It reminds me of the sweet I was given last week as a Thank You for helping the English Club. Anyone else in Japan have different experience? Are your lady coworkers showering your male coworkers with sweets for love or otherwise? Students, on the other hand, are a different story. This morning I noticed many of the girls had bulging shopping bags in addition to their usual bookbag/gym bag combo, and when I got in, the distribution had started. Some of the more popular teachers came back from home room with great piles of sweets, and in the classrooms the students had bags of the stuff too. Some teachers have enormous piles of homemade sweets and confectionery! One of the most interesting aspects, to me, is that there is a great emphasis on home made treats. I was caught off guard to find that there were elaborate displays of beautiful empty boxes at the department store, and a sudden baking section had sprung up in the atrium. There were also tons of gorgeous boxes of chocolates from Godiva and Mary’s (where I got my Lucky Bag on New Year’s) and various hotels and chocolate companies, but even the combinis have kits to make your own sweets at home. 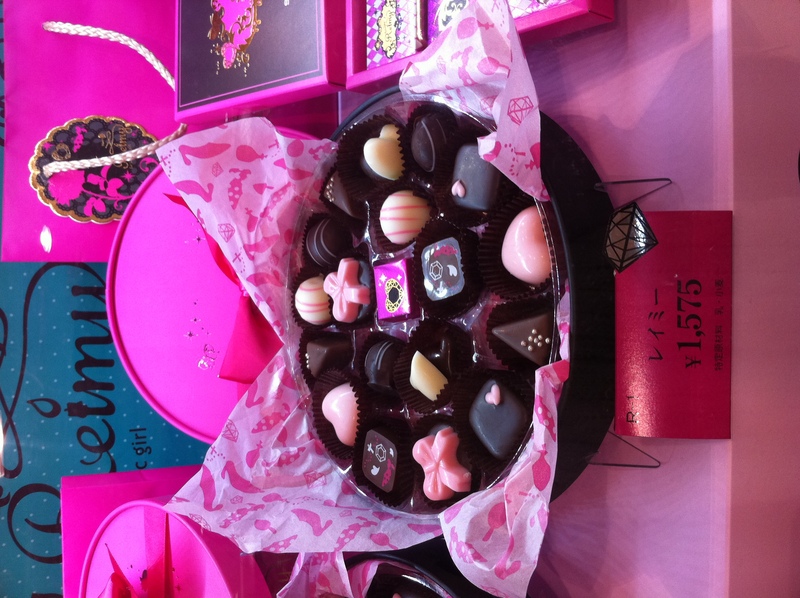 When I mentioned that I had some chocolates for Sean, a little box of sea salt caramels from Ginza Cozy Corner, the first question I got was “Did you make it?” Even simple assembly is acceptable—simply melting chocolate and pouring it into molds is quite popular. There’s also a trend to take a plain chocolate bar, or a handful of Pocky sticks, and use icing to cover them in messages and colorful candies. 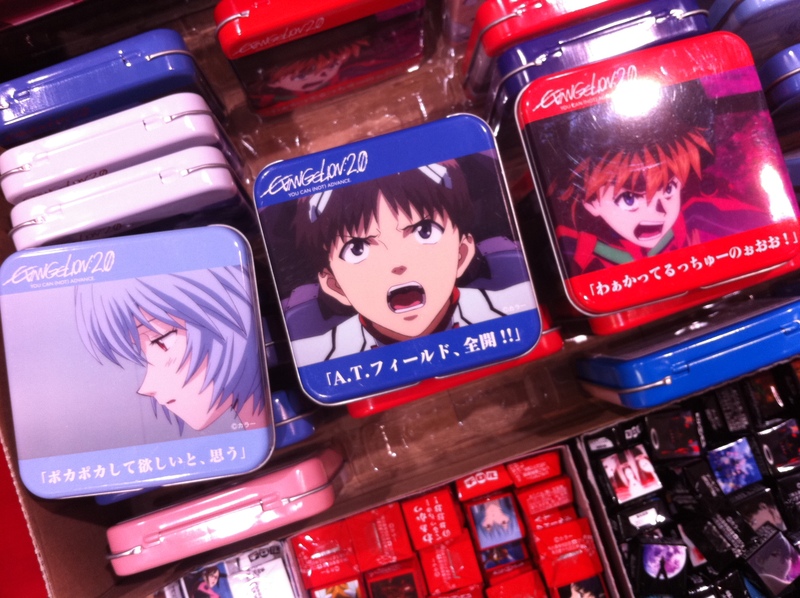 They even make special display boxes for your creation! In the States, one of the biggest complaints I hear about Valentine’s is that it’s a “Hallmark Holiday.” Here, the emphasis seems to be on individual effort and creation. People don’t even really do cards or “Valentines” as we know them. Instead the complaint seems to be the cost and pressures put on women to provide and produce sweets that may not even be reciprocated. However, both sides complain that the feelings are sometimes forced and artificial. Men are supposed to reciprocate on White Day, or March 14th. Apparently this idea was thought of by a Marshmallow manufacturer as a “Response Day” after the women-only typo had become entrenched. Men are expected to give white chocolates and presents, and apparently this is a bit closer to how we celebrate VD in the states. I’ve heard that men are expected to return the favor multiplied, giving back perhaps 3 times as much as what they originally received. Also, supposedly the softer a present you give, the less your feelings for someone, thus making marshmallows to ironically actually be possibly rude or disappointing gift. Has anyone else heard this, or can confirm or deny it? So on this morning, I was hoping I might benefit a bit from the recent trend of girls giving to chocolate to girls. My supervisor mentioned it might happen, and her desk was buried in treats on Thursday from 3rd Years, so I had hope when I came in. Lo and behold, the best thing happened at lunch time. A group of my favorite 2nd Year girls showed up with treats! One girl brought 2 enormous boxes, and let me choose from chocolate cake or chocolate mousse. 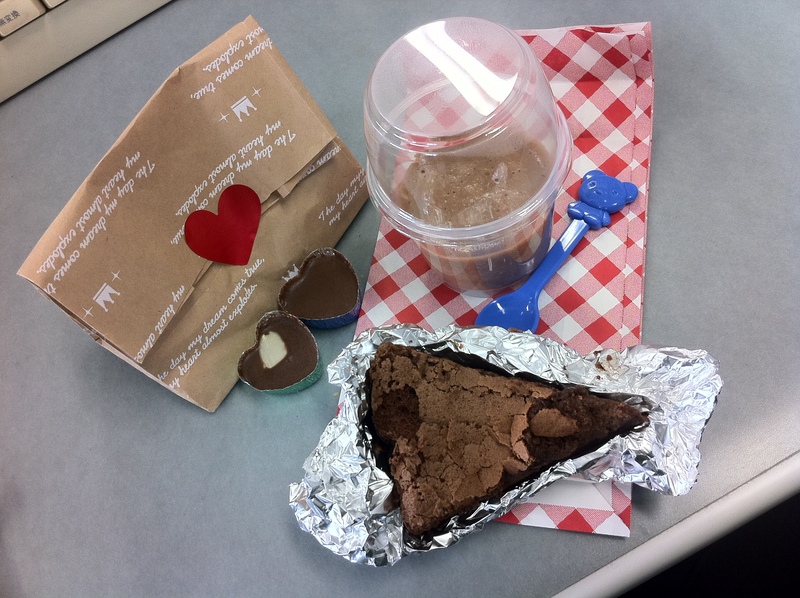 Another brought a little bag with homemade cake and hand made chocolates. A third girl brought an essay that was due today with apologies for not having a sweet, but promises to come back. A little while later she brought a baggie with two slices of cake, and said that she hoped it didn’t give me a stomach ache because she was a beginning cook. Adorable! A fourth girl brought me scones, and a group of 1st years gave me a little chocolate after class 1st period. The other girls said their mothers helped them cook, and the treats were all ridiculously delicious! It’s not every day I get chocolate mousse at school! Apparently on White Day it is still expected to reciprocate even when girls give to girls. My supervisor said something small is fine, but it would mean a lot to the students who received it. It’s easy for me, because the treats were from girls who stop by most often to chat, so I won’t have any trouble to remember who deserves treats in March. One coworker had a pile of individually wrapped rice crackers that he was handing back immediately, and one coworker was worrying about how she was going to remember who gave her what. They had all come in a flurry in home room, and of course, no one does cards here. She ended up putting post-its with the gift givers’ names on the treats, and then taking a picture with her cell phone so that she can remember later. Clever! 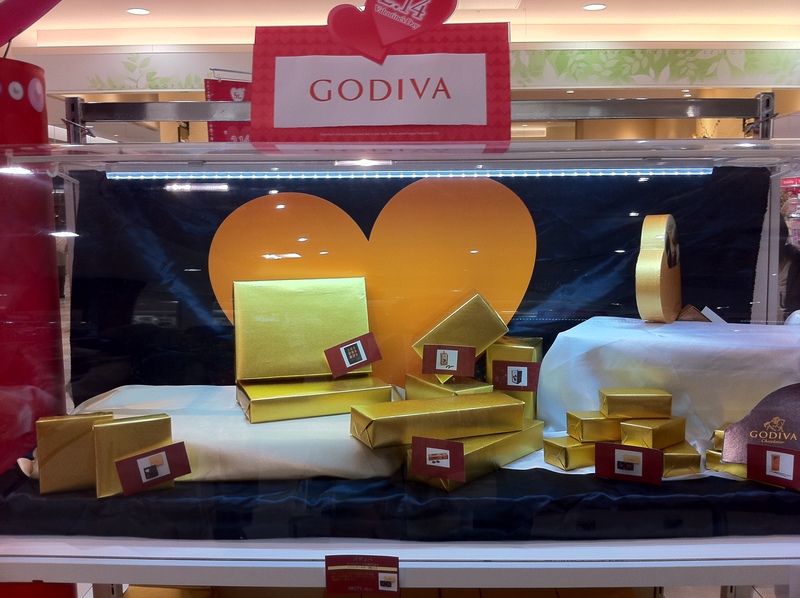 The Godiva packaging was surprisngly plain! However, when a female student gives a chocolate to a female teacher, is it giri-choco or tomo-choco? The student/teacher relationship implies giri-choco, but the female/female relationship speaks more to friendship and tomo-choco. My coworkers could not decide which category this fell under. What do you think? We also came up with a new category. One male coworker said that certainly his 8 year old daughter would give him chocolate, but his wife was less of a certainty. Another said his wife would give him giri-choco, or maybe nothing at all. There is giri-choco, tomo-choco, and for those not getting anything? No-choco. In America many complain that Valentine’s reminds them of the lack of romance in their lives, but I think the Japanese have the market cornered on loneliness. If one doesn’t receive honmei choco that’s one thing, but to not even receive giri-choco is a lonely fate indeed! Not only does no one harbor romantic feelings for you, but they also don’t feel culturally obligated towards you for any reason, in this cultural that is all about cultural obligation. So that was my first Japanese Valentine’s Day. I like that the focus is on home made treats, and that women giving chocolates to women is becoming more and more popular. It doesn’t quite feel like Valentine’s day without out cards and commercials on TV, but overall it seems a bit nicer than how we do in the States. Of course, I say that without feeling any obligation to bring my coworkers giri-choco, which might color my view of the holiday. 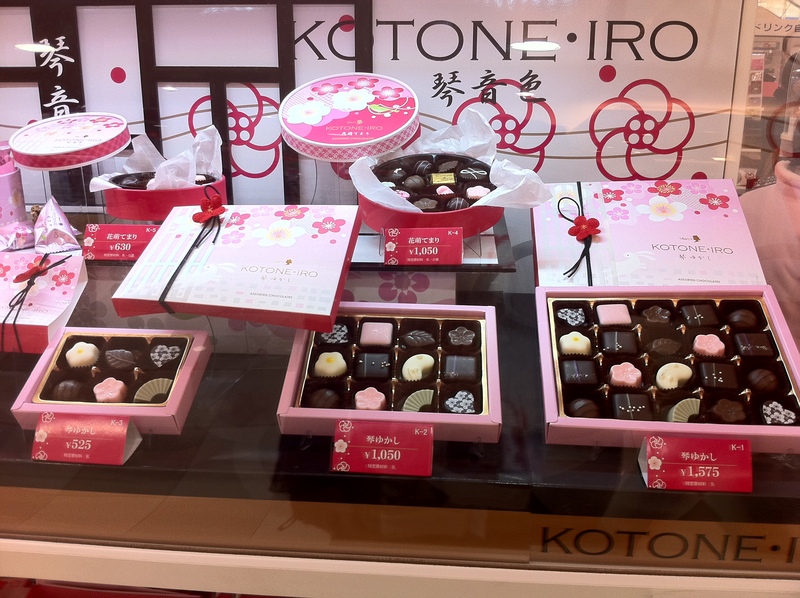 What do you think of Japanese Valentine’s Day? How do you celebrate in your area? Is it similar, or something different? And of all the treats I posted pictures of, which look the best to you? This entry was posted in Modern Traditions and tagged chocolate, gift, holiday, modern, present, sweet, tradition, treat, Valentine's Day. Bookmark the permalink. I’ve always felt guilty that all my knowledge of Japanese culture comes from comics, but you’ve confirmed almost every Valentines Day chapter/episode I’ve seen. I even recently saw the frosted Pocky, I need to try that! Also, “…apparently this is a bit closer to how we celebrate VD in the states…” made me laugh taken out of context. In a way I like Japanese Valentines better. After years of buying flowers, chocolates and nice dates for girls, it is nice to get some back in return. However, this year was a dead space at work. Nothing from any of the teachers OR students, which sort of surprised me. At GEOS I often got some from both students and co-workers. Of course, the good news is I am now free of White Day reciprocity! That’s really interesting. 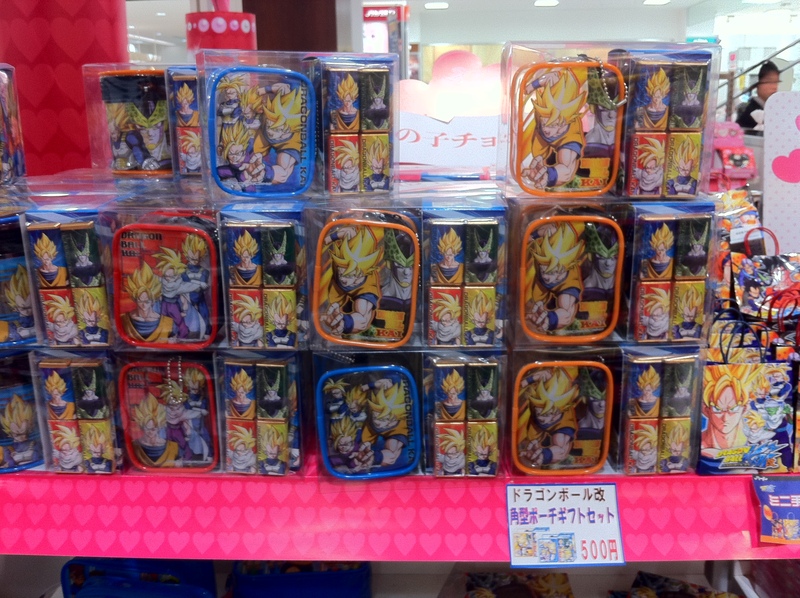 I think I prefer the Japanese spin on Valentine’s Day to the way the US observes it. Nice write up! I went “awww” at the girl who said she was a beginner cook! How was the cake, can I ask? I noticed a typo: “in this cultural that is all about cultural obligation.” Might wanna fix that?